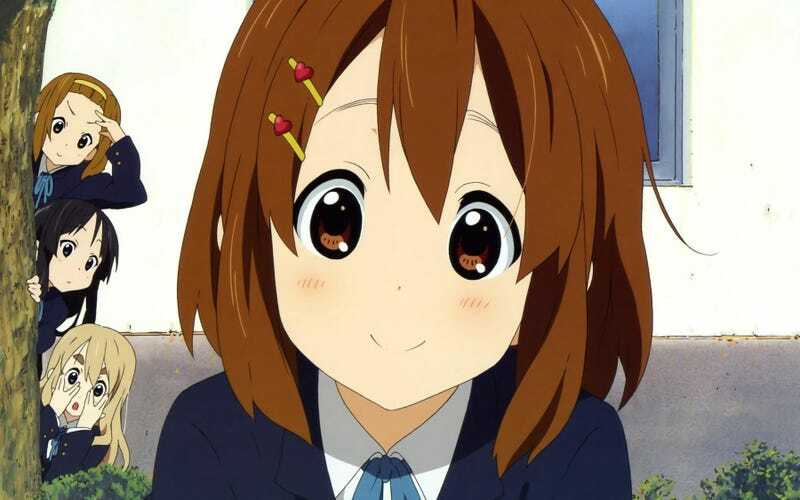 Kyoto Animation is one of Japan’s most famous anime studios. Besides its shows, the studio is famous for another thing: large eyes. This piece originally appeared 10/21/15. The big K-On! eyes are not entirely Kyoto Animation’s fault. Below, you can see how the original manga (top) compares with the anime (middle). Those are the voice actors on the bottom. At this point, though, modern anime and manga are probably drawing more on dominant Japanese stylistic conventions than directly from, say, Betty Boop cartoons. This is evident when you see drawings of people practicing their Kyoto Animation eyes. But what exactly makes a Kyoto Animation eye a Kyoto Animation eye? That’s a trickier question than you’d think. This is a close-up of your typical Kyoto Animation style eye. Using a practice drawing by Twitter user eroron_eroron2, let’s analyze the different parts of the Kyoto Animation style. Note that there are sometimes reflections in the bottom part of the eye, too. If we look through anime the studio’s created, we do see a definite pattern. Again, this is not a bad thing! This is Kyoto Animation’s style. There are caveats, such as anime boy characters whose eyes are slightly smaller. This is a way to make them appear cooler. Anime boy characters with big eyes can be cuter. Also, Kyoto Animation’s style has developed and changed over the years. They’re not exactly the same eyes, but you can tell that Kyoto Animation created these images.